Plus Total 8 Bonus Extra Items worth $60. *11 Extras,$600 Values, Great Notions 1000 Embroidery Designs CD, AllBrands USB Stick Drive Memory Key Required to Transfer Designs from Your Computer to Machine, Free Monthly Brother iBroidery.com Designs, Creative DRAWings My Editor & Sizer Embroidery Software, Wilcom TrueSizer Format Conversion to .pes format Software, DIME Inspirations Thread Color Conversion Software for 15 Brands, 21 Exquisite Stabilizers Sample Packs and Stabilizer DVD, DIME Designs in Machine Embroidery Magazines Offer, Embroiderers Compass Guide by Deborah Jones. —Brother PE770 is a Recommended Best Buy Computer Embroidery Machine in Consumer Digest Magazine!— Brother PE770 Embroidery Machine Scoress Consumer Digest Best Buy Awards. "AllBrands is a Brother Authorized Dealer and ASC Authorized Service Center for any repairs including warranty parts and labor. We give unlimited technical support by email, fax and phone. We service machines in our stores and/or refer to nearest ASC centers nationwide. Mass merchants do not have tech service or repair departments for your equipment. They are unable to help you directly, only referring any operational, mechanical or electronic questions back to the manufacturer instead of taking care of problems themselves. Manufacturers and customers should expect that any problems will be taken care of by the dealer or merchant who sold you the equipment, not just by referring your requests back to the manufacturer." Expand to 12x5" hooping with optional SA445 Extra Large Embroidery Hoop & Grid multi-position embroidery frame. Also available SA443 4x4", SA442 2x1" and Extra SA444 5x7" Standard. 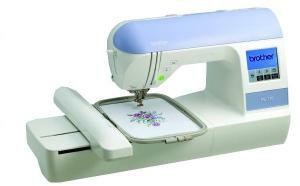 The Brother PE-770 is the latest computerized embroidery machine that is compatible with USB Memory Sticks! Import designs up to a maximum of 5” x 7”. Utilize the Brother Memory Card Library for even more designs. Now you can embellish everything from home décor to T-shirts with one of 136 built-in embroidery patterns which include delicate scroll work, intricate florals, classic quilt patterns and so much more. 10 built-in frame shapes and 12 border styles. Memory function: Save designs for future use. Backlit LCD touch screen: 1.6" x 3" backlit monochrome touch screen LCD. Carrying Case Style Dust Cover with machine handle sticking out of soft plastic dust cover. LCD Touch Control Panel: 1.6"x3"
Back a few months ago, you helped me TREMENDOUSLY with the above machine I purchased from you last year. Your customer service from you and the other members of your company was the BEST I have ever experienced from any organization in my life. You should be extremely proud of your company. If you gave me a survey and I had to rate questions 1-5, I would write in a "10" on every answer. I am not just saying this, it is the truth. Since I've been monogramming and appliqueing, some of my friends and acquaintances have expressed interest in doing it themselves and I have told everyone of them to buy from you. Even though it would be an internet purchase and you are located in LA, it did not matter, they would receive better service than if they bought it in Mobile, Al, which is located about 25 miles from us. Terri D.
Am very pleased with the service. I have recommended your site to others looking for a new or replacement machine. The selection of "bonus" items is a nice plus. Your prices are competitive and free shipping made the difference between buying on line and shopping around in the metro. The ad for this machine says it will ship in 1 to 2 weeks yet I received the machine only 6 days after placing the order. Keep up the good work! As a person who shops on a budget, I am very glad that Allbrands makes equipment affordable and attainable. I would say that 99% of the time Allbrands has the best price or best value - I was excited to see available the Brother XR 9000 machine, which I also ordered. As an online shopper it is important to go with a company that has proven quality product offerings. I hope to purchase within the next few months a cover hem serger (another Brother product) to round out my sewing needs. Thank you again.